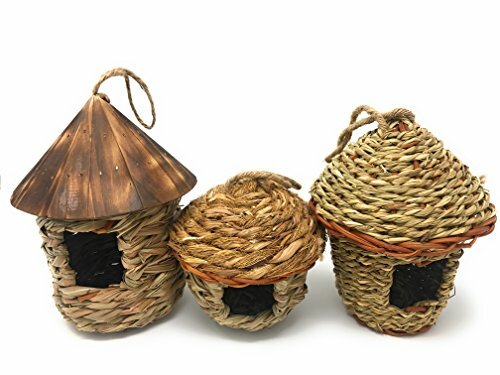 Transform your outdoor living spaces into a haven for your favorite local small birds and their families with this charming set of three handwoven, all natural grass nesting pockets. Set of three house-style roosting pockets includes one with a wooden roof, one with a twine roof, and one all grass. Materials are chosen to provide birds with a sense of familiarity, as well as lend your outside decor a rustic, woodsy look. It is recommended that you hang nesting pockets in locations where they will be protected from direct weather and salvaging by squirrels. Please note, exact specifications will vary due to handmade nature. Roosting Pocket with Wooden Roof: c. 7" x 4.5"
Small House Roosting Pocket: c. 5" x 4"
Give small birds shelter from the elements with our handmade grass and wood roosting pockets. Set of three roosting pockets are constructed with a variety of grasses for a natural appearance and feel. The rough surface make entrance and exit easier for birds, as well as provides natural drainage and ventilation. Natural materials make it easier for roosting pockets to blend with surroundings, so wrens, chickadees, finches, titmice, and other small songbirds can protect themselves from predators. Both functional and attractive, our nesting pockets will add rustic charm to your outside decor. Roosting pockets will last longest if hung in sheltered locations, such as under eaves or in bushes, wherever birds are prone to build their nests. Built-in waxed twine loop makes it simple to set up. If you have any questions about this product by Lantern Hill, contact us by completing and submitting the form below. If you are looking for a specif part number, please include it with your message.